The office market has been slow to recover Downtown despite the explosion in residential (and soon retail) development. It looks like at least one property owner has grown tired of waiting for the market to fully rebound. There is a proposal on the table to transform the 82,000 SQFT building that houses the Lincoln Law School at 1 N. First Street into a residential project. The dated, and dare I say ugly, facade would be transformed into something much more modern. The rendering below reminds me of The Pierce in SoFA. The project would result in 72 residential units across the five floors and 7,500 SQFT of retail on the ground floor. The fifth floor would be added on top of the existing building and there would even be some units tucked into the basement. Those underground units won't be as bad as they sound since an atrium will funnel natural light to them. However, one big question mark is whether it is even worth remodeling the building on such a key corner, or would it make more sense to tear the whole thing down and build a high-rise project in its place. Many people would like to see a Class A office building here, especially with the proximity to the future Downtown San Jose BART station. If the project does get approved by the city, construction will take less than a year. 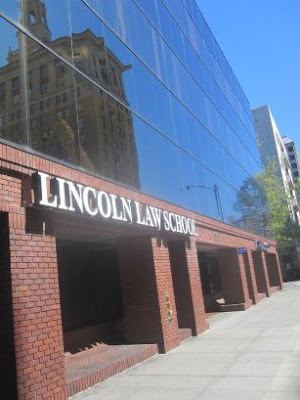 As for the Lincoln Law School, don't worry--it is already being relocated to another Downtown building at 384 S. Second Street. Source: SVBJ, Hat tip to Drew S. for sending this in. I don't have any problem with this building getting converted to residential, as long as it's RENTAL residential. That would allow the building to potentially be redeveloped at a higher density, either for residential or office, when BART arrives. The last thing we want is for this to go for-sale residential, because then the HOA will never allow the building to be densified in the future. The current building, the new proposal, or both? A high rise with ground retail and an outdoor roof restaurant/bar. Mixed use of retail, office and residential. We need to create a more dense downtown near bart.